The effectiveness of environmental regulations (ERs) has been examined carefully in the past time; however, the inputs of ERs have been neglected so far. In order to track the relationship between inputs and outputs of ERs, this paper first constructs an environmental regulatory efficiency (ERE) index system and develops an entropic slack-based model suitable for measuring China’s ERE during 2004–2014, which considers the entropic allocation of multiple inputs and desirable and undesirable outputs. The influencing factors of ERE were then explored by the panel Tobit model. Results have illustrated that in China, ERE is relatively low in general, with significant and narrowing geographical discrepancies, and ERs are becoming more and efficient from 2004 to 2014. From the regional view, the east has the highest ERE values, followed by the west, then northeast, and lastly the central regions with the lowest values. Furthermore, it has been discovered that the economic development level and population density both affected ERE positively, while technological innovation and industrialization level exerted a reverse effect. From the perspectives of the level of opening-up and urbanization, environmental pursuits, all three displayed no correlation with ERE. The conclusions may be helpful for the Chinese government to improve ERE. We are grateful to the editor and reviewers for careful review and insightful comments. This paper is sponsored by the National Natural Science Foundation of China (nos. 71801131, 71703065, 71573186 and 71573121), Six Talents Peak Project of Jiangsu Province (no. JY-032) and the College Graduate Research and Innovation Foundation of Jiangsu Province (KFJJ20170911). Pan, X., Ai, B., Li, C., Pan, X., & Yan, Y. (2017). 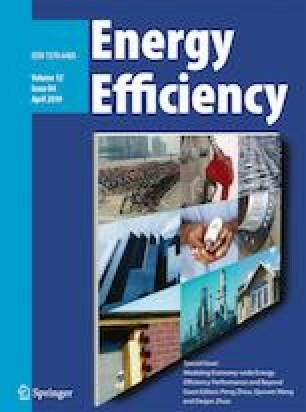 Dynamic relationship among environmental regulation, technological innovation and energy efficiency based on large scale provincial panel data in China. Technological Forecasting and Social Change. https://doi.org/10.1016/j.techfore.2017.12.012.